Cherries are set and ripening! We will update you soon with our opening date for U-Pick season. Follow us on FB @bloomfieldcherriesbrentwood and on Instagram! 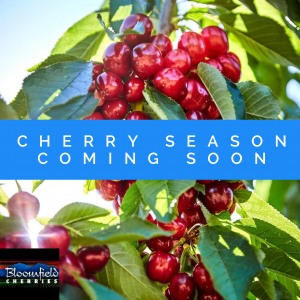 U-Pick cherries open mid may thru june 9AM to 5PM, wed thru Sunday. Coral, Brooks, Chelans, Sweethearts, Lapins, Royal Tioga.